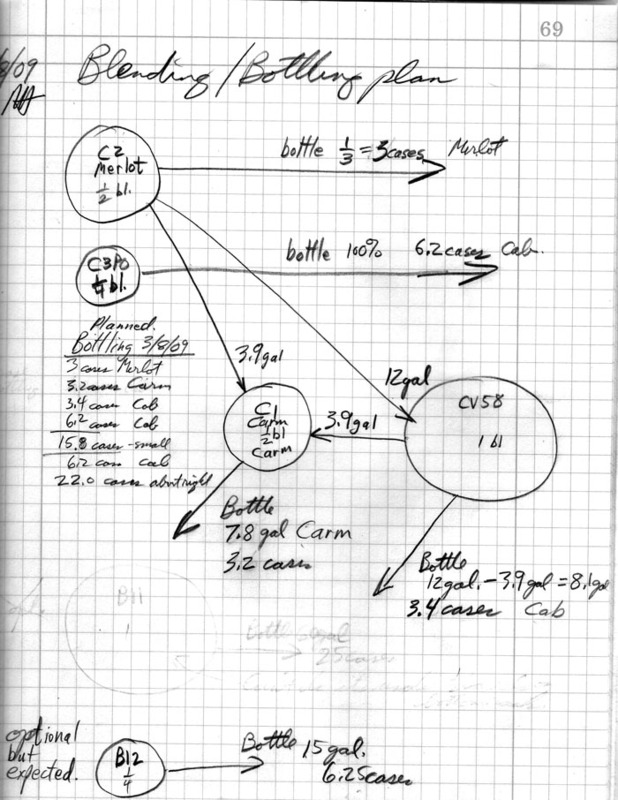 Here is the Bottling and Blending plan for 3/8/09. 1/15/2009 Gary Mark and Mike Jawetz tasted the wine post dilutions and generally found good improvements in all cases, primarily in bitterness reduction on the finish. 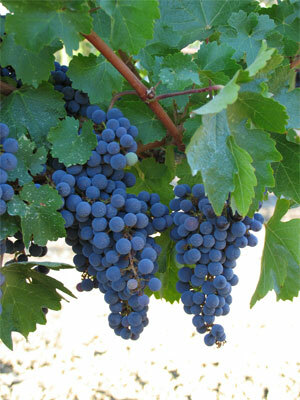 The Merlot in C2 still has some bitterness as did the Cab in CV58 which is worth addressing with slight acid adjustments. We liked the Carmenere as is and B11 seemed almost light and very smooth to us (late in the evening). B12 had some of that Carmel/Cognac nose and was good as is with a nice very moderate astringency. C3P0 which had too much oak and too much of the Cognac was greatly improved by swapping out 3 gallons of it with Barrel B11. It is still very high intensity, high alcohol and moderate astringency. This is the most extreme wine of the bunch but it tasted really good at the end of the night. I would like to make a small acid adjustment just to make it even more extreme and to balance the alcohol a little better. 12/16/08 Gary and Mark carried out dilutions as noted below. In addition we exchanged 3 gallons between barrels B11 and C3PO. Dilute the Merlot in C2 to reduce alcohol 1%. Blend 15% cab and 15% Merlot into the Carmenere. Exchange half of cab in C3PO with either barrel B11 or CV58 to reduce oak in C3PO and attenuate its quirky nose. The ML chromatograph below shows that ML fermentation has completed successfully in all barrels. It looks like the alcohol level of all the 2006 wine is high which is consistent with the bitterness detected in the last tasting. The good news is that this is easy to fix by diluting the wine and it will taste much better than it does now. It may subsequently require adding in more tartaric acid to get the balance right but, the acidity is on the higher end of the range so it may not. It is my recommendation that we dilute the wine back to the 14.3-14.9% range with some variation across barrels and wait another 6 months for the wine to integrate the water. I included a sample from 2007 for reference. We have liked the acidity and alcohol level of this wine. 10/16/08 Wine analysis done in Napa. C1 1/2 SM Carmenere Smooth Lower acid, different nose, nice. With the 66%/16/16 Carm/Cab/Merlot blend tasting so well from 2007 we should definitely try this blend again as well as a Cab Merlot Blend. But, first we need to get the alcohol levels down. C1 Carmenere Good balance, somewhat bitter finish. Nose good -no green pepper. Mid palette excellent. Seems like oak is imparting a nice influence. Carmen liked the bitterness. CV58 Cab Hot high alc. Somewhat bitter but not astringent, drinkable now. Brought 21 bottles total over to Gary's. 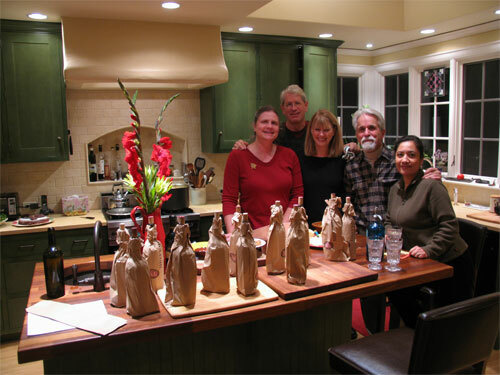 A picture of some happy taster's in our gracious hosts', George and Susan's, new kitchen. +2 Tank F Cab 2006 (5) hint of sulfur reported. The wine was pressed on 11/18/06 in good weather. At one point a hose flopped out of tank E and we pumped about 2.5 gallons of wine on the floor in the back of the garage. Natalie discovered the problem within a minute of the event or we could have had much more wine lost. All but the Carmenere could use some straight dilution to bring down the acidities, alcohols and tanins depending on co-op member's preferences. We will meet on 11/29 to discuss. I suggest dilluting at least one barrel's worth to make a little lighter version of this wine targeted at something like 14.3% alcohol. A B Cab 35.7 6.9 3.6 .4 14.8 From thickest must, very dark, moderate astringency, not bad. C Carmenere 27.5 6.95 3.92 .3 14.4 Spicy green pepper variant in nose' nice, intense. F A&G 71 6.6 3.6 .4 15.1 Neutral nose, some tea in flavor, no green pepper, balance and mouthfeel good but very intense. E C&D 72 6.45 3.7 .4 14.7 Like F.
Botrytised Cab 4 6.37 3.57 .3 13.2 Best nose, sweet fruit, slight musty nose, light color, cloudy, nice tartness, bitter finish. Press yield was .71 for tank B which had the thickest must. Yield for C&D was more than .72 because some of it went into tank F. The press yield for the Cab in tanks A,C,D&G going into tanks E&F was 143gal/186 gal = .77 which is very good. Merlot yield was .80 and Carmenere yield .74. We picked 2307 lbs. of Cabernet Sauvignon on 10/14/06. We ended up with 219.6 gallons of must. Tank Vol.gal. Brix(refr) S.G. T.A. pH Post Additions S.G.
B 50 27.2 1123 6.9g/l 3.5 " 1110 Densest must. We harvested 338 lbs. of Carmenere on 10/14/06 and ended up with 35.8 gallons of must. Probably one bin didn't get weighed which would explain the low volume per weight. The Carmenere was fermented using Maurivin yeast from Australia which was different from the Noble yeast used for the rest of the wine. T.A. was 5.85g/l in the Tank with a pH of 3.48. The T.A. measurement was strongly sensitive to the amount of stiring of the juice before pipetting. Pipetting off of settled solids resulted in a T.A. of only 4.3g/l. No acid adjustment was made. Specific Gravity of the must was 1118. Must was watered back by 9% by adding 3.2 gallons of water. This should have reduced the T.A. to 5.27g/l. .4 g/l of tartaric acid was added to bring the acidity back up to 5.7 g/l. Fermentation completed at S.G. 997 on 10/11/06. Nutrients were added along the way. See notebook for details. 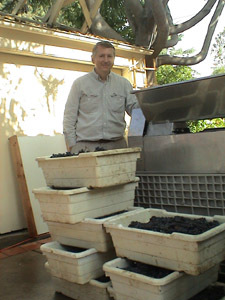 The Merlot was harvested on 9/17/06 between 8 and 9:00am in the morning. The Brix measured the night before was 26.5. Brix in the tank post crush was 26.6. We picked 419 lbs of grapes. In the tank we ended up with 35.6 gallons. On 9/12 the acidity was 5.7 G/liter with a pH of 3.14 and Brix of 25.4. 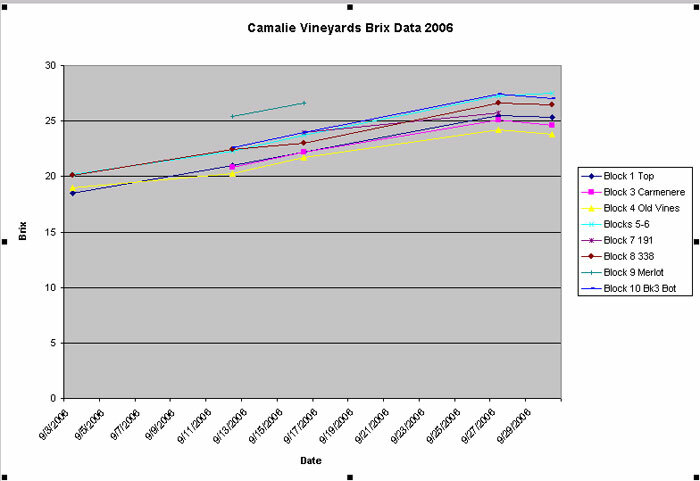 Brix Chart below summarizes Brix data to date. With the sugar spike on 9/27 we increased irrigation to enable a longer hang time without shriveling. 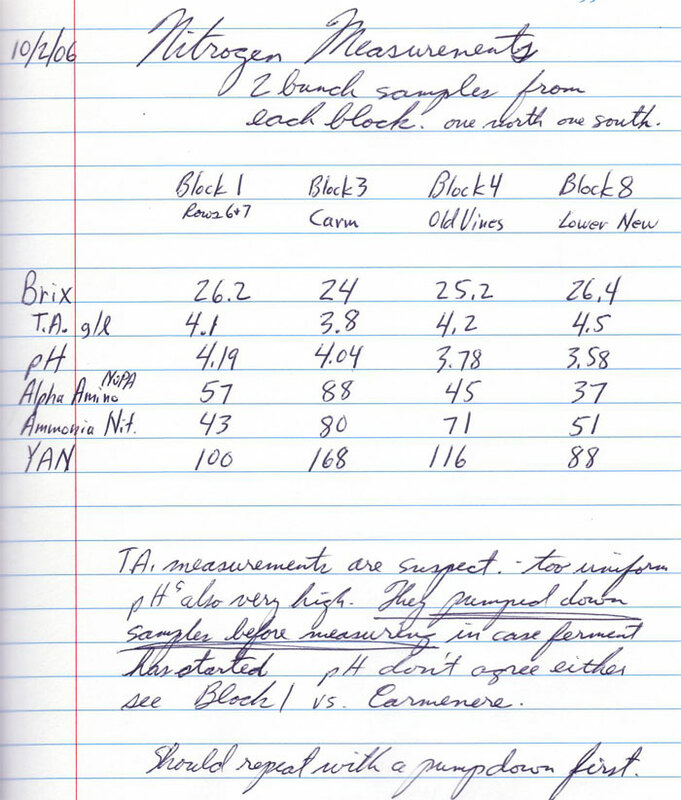 The measurements below were taken by Gusmer Enterprises Inc. Nitrogen levels are on the low side which is typical of hillside vineyards which have not been fertilized aggressively. 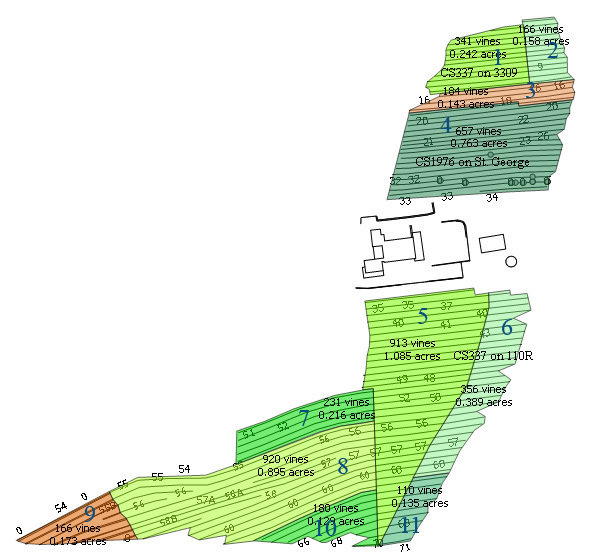 Note block 8 is more in line with the upper blocks than it was last year in terms of Nitrogen levels but still has the lowest Nitrogen levels. 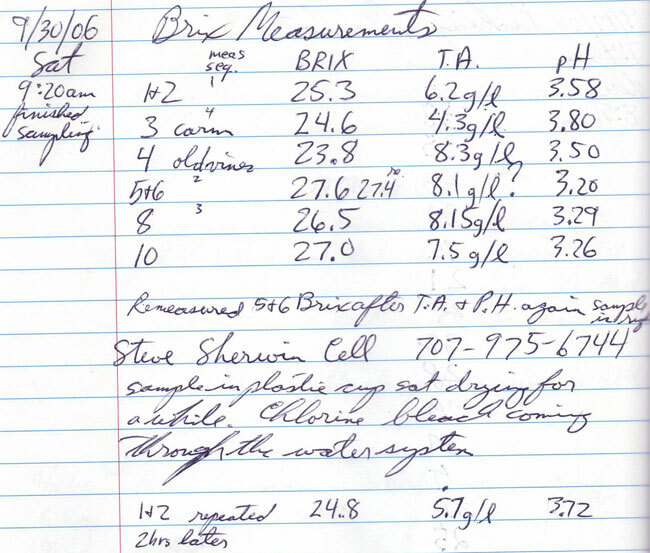 Below are my most recent acidity measurements. Note mine are much higher. Sampling was different for these measurements than the Gusmer measurements. 50 grape sample vs. 2 bunch. I tend to believe my numbers are better but, I should remeasure after pumping down my samples.